Deconstruction. Thata��s the new word the upcoming restaurants are following, especially when it comes to the interiors. The look is worn-out and gives an impression of rugged, used surfaces. The newly opened restro-bar Drunkyard at Gachibowli is no exception. Barely a month old, its interiors are done with used bicycles, bonnets of old cars, beer bottles and even junked attaches. What makes this place worth exploring is the authentic rustic flavours of food even when the cuisine is Chinese or Indian. The entrance divides the open kitchen and the restro bar. The pathway lit up with Chinese lanterns leads you to an area that is divided into an open and closed zones. The latter is a dimly lit with the bar at the end. 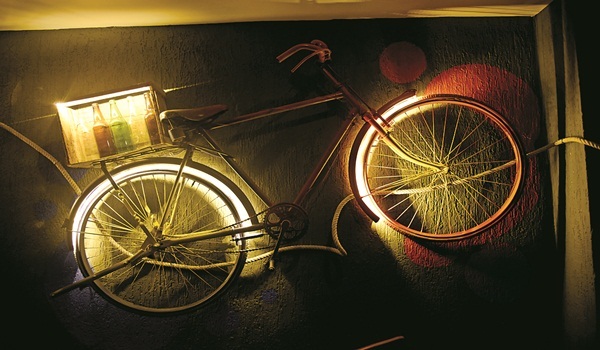 The walls look quirky – used bicycles hanging with the help of thick white ropes. On the adjacent wall are hoods of two jeeps in bright green and yellow with some interesting graffiti done. In between the creative works on the wall glow yellow bulbs that give the entire area an eerie look, more so when the bar-counter is bathed in midnight-blue light. The ceiling is fitted with used wooden boxes used for shipping fruits. The lids are closed from which filter dim light of bulbs. The other wall is dotted with wooden mini frames of closed doors and windows. Naked brick-walls peep here and there. Open the glass door in the middle and outside is the smoking zone with wooden benches and tables. Above hang ropes in criss-cross pattern with glowing bulbs that dangle with the cool breeze. Outside wall is of wooden planks jammed with used beer bottles in green and red colour. You also get to see truck tyres painted and arranged on top of one another. Says owner Priyanka Mechineni, a�?I have designed the restaurant myself using materials that were recycled.a�? The food is of rustic flavours even if it is a platter of kebabs. The reason? The chef hails from a small village 80 km from Hyderabad. He had added 14 types of spices to the Fish Kebab that we had. The restro-bar has an interesting array of Chinese and Indian starters, fries, main course and desserts.